If you’ve been following the flagship Harley Quinn series to this point, you’re well aware that the Rebirth run is just as good as the New 52 one that preceded it (you can check out our review of the first trade paperback here). Actually, that comes as no surprise, because it likely has everything to do with the fact that DC retained the same stellar writing team of Amanda Conner and Jimmy Palmiotti. 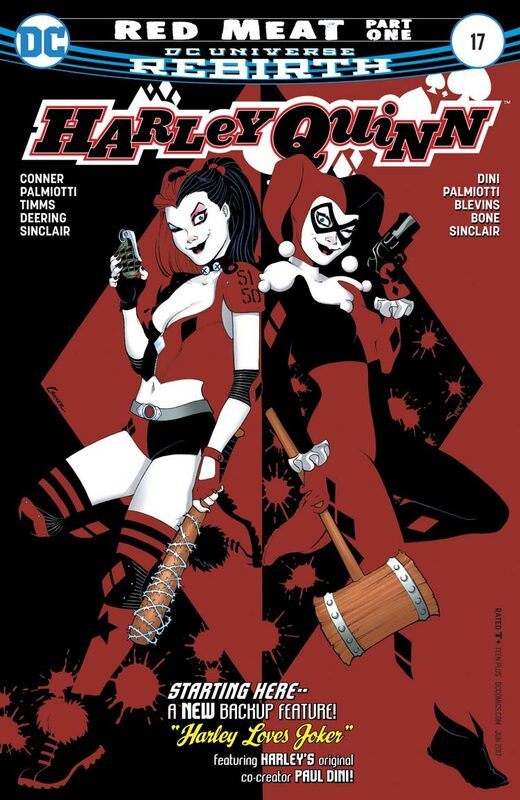 As if the series couldn’t get any better, it was revealed not long ago that the Clown Princess of Crime’s co-creator, Paul Dini, would be boarding the title in the spring to contribute backup stories, naturally chronicling the earlier exploits of the character. Fortunately, the new status quo begins next week. “Honestly, it was an idea we were bouncing around, like, what if Bruce Timm and Paul Dini did back-up stories with classic Harley — a Harley Loves Joker type of thing. Bruce Timm was too busy, and Paul and I started talking on Twitter. Then we came to the point where we pitched it as a back-up story. We got Brett Blevins and Jay Bone and Alex Sinclair. And they went for it. Harley Quinn #17 arrives in comic shops on Wednesday, April 5.